In this treehouse the designer decided to give importance also at the stairs and give them a second function. People can use them not just to reach the treehouse but also to watch at the surrounded landscape. 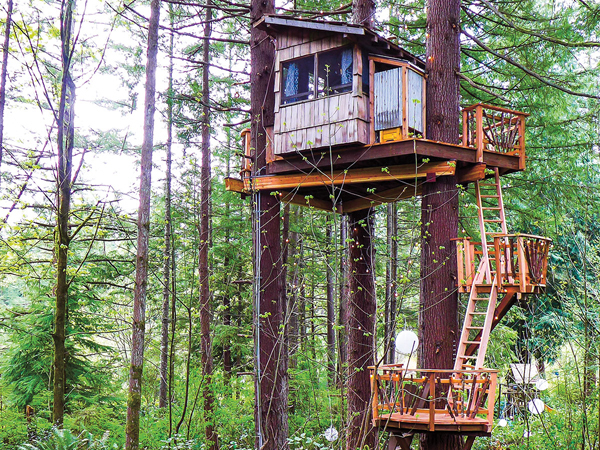 The position of the trees give the form of the treehouse. A triangular platform that is partially occupied from the house and partially becomes the big terrace and entrance. It’s interesting the use of the materials of this treehouse: new wood for the structure and -I guess- recycled materials for the cladding.